We are just two weeks out from my little one’s first day of preschool, and I’m trying to keep all of my conflicting emotions from boiling over into an ugly cry fest. This has been a special summer with my dinosaur-loving three year old. We have watched him move from baby into full toddlerhood, complete with potty training, tackling four syllable words (triceratops, anyone? ), and throwing some major tantrums. These have been some of the most challenging and hilarious days of my life. We’ve fully embraced the summer schedule, making allowances for late night fireworks and bonfires, and pushing nap times off so we can spend just a few more minutes at the pool or the zoo. We’ve gone to bed dirty and smelling vaguely of sunscreen, then slept in and spent the morning lounging in our pjs. We’ve made the most of a relaxed summer schedule, but I know in two weeks that 3 year old who loves running around with his matted hair and Thomas undies is going to have to show up to preschool at 9 AM fully dressed and ready for the day. With the change in schedule looming ahead, we’re aiming for earlier bed times, which also means earlier dinners. I’m saying goodbye to summer nights when I didn’t think about dinner until 7 PM and then threw some popsicles at the kiddo and called it good. The days ahead will require a bit more planning, but that nerdy part of me who loved back to school season as a kid is still excited about a return to structure and routine. My favorite meals for this time of year are simple and fuss free, but hearty enough to satisfy on cooler fall nights. While we eat our fair share of burgers over the summer, I find myself cooking with beef much more in the fall and winter. 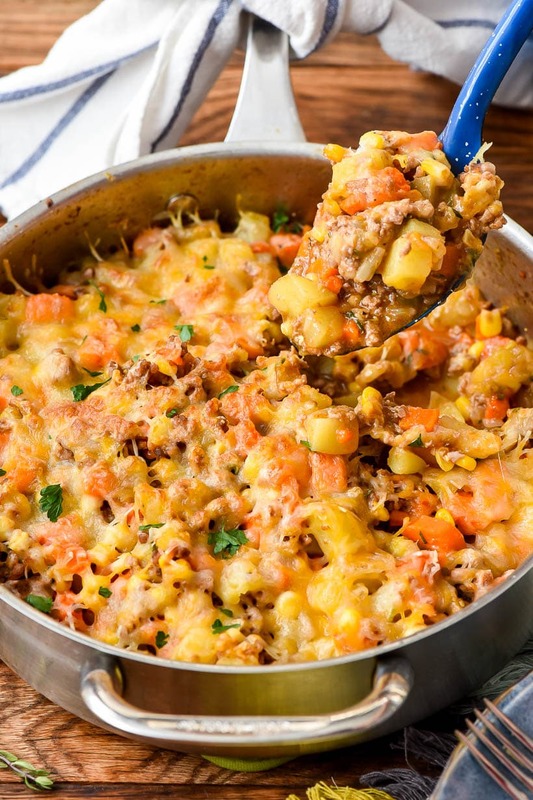 Quick cooking ground beef lends itself well to crowd-pleasing casseroles like this Johnny Marzetti, lunch-box friendly recipes like Cheesy Ground Beef Empanadas, and of course, family favorites like Walking Tacos and 30 Minute Ground Beef Gyros. I love to buy our ground beef in bulk, either at the grocery store or through purchasing a share of beef. I’ve written before about the process of buying a side of beef before. It’s not as intimidating as it may seem, and we love the money savings and convenience of having beef in the freezer year round. Still, if buying a side of beef isn’t for you, there are plenty of other ways to save on beef as well! 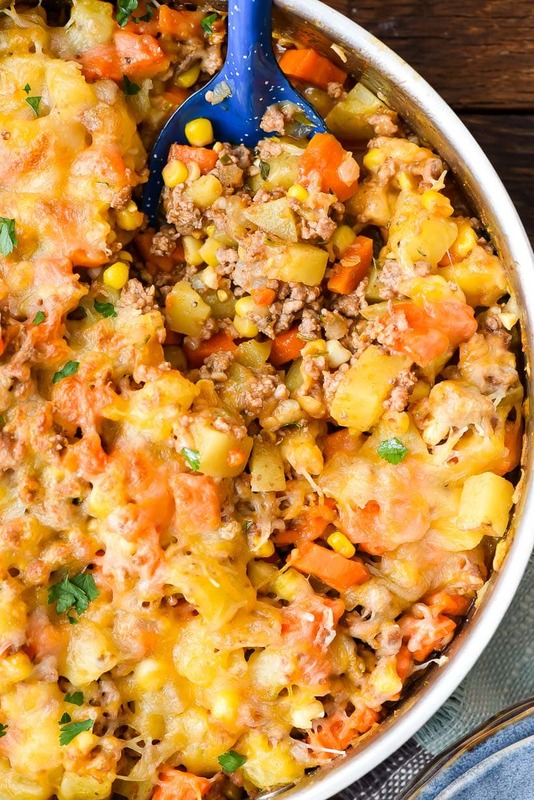 For this recipe, two of my comfort food favorites–ground beef and potatoes–combine with a slew of other veggies to create a single skillet meal that’s perfect for busy school nights. I like to think of this Ground Beef and Potatoes Skillet as the quick, stovetop equivalent of stew. It’s rich and filling, but only takes about 40 minutes, a cutting board, and a single skillet to make. The first time I made this, the Mr. said he wanted it to be even more savory, so I amped up the flavor with extra beef broth, Worcestershire sauce, and tomato paste. I always forget about the power of tomato paste, but it’s really an unsung hero in the flavor department. Give it time to caramelize and soften with your other vegetables, and you’ll be rewarded with a rich punch of umami that’s just what the Mr. ordered. 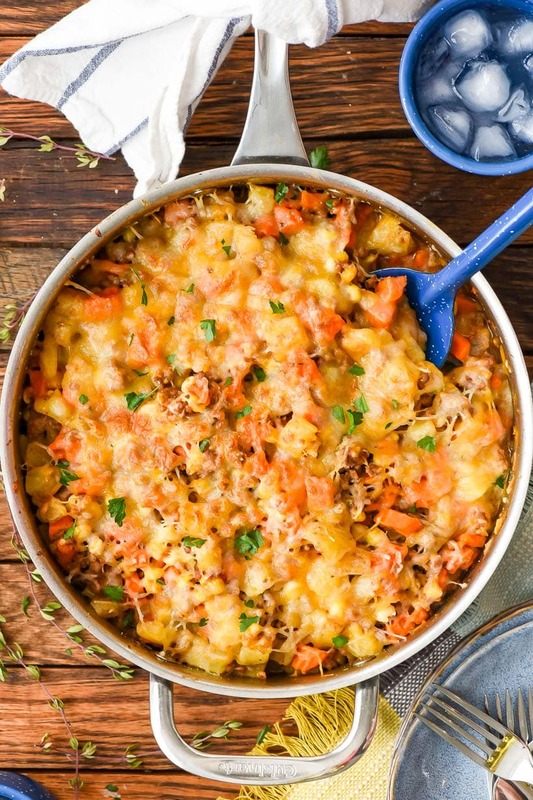 This Ground Beef and Potatoes Skillet is a really flexible recipe that’s begging for you to make it your own. Start with your base of sautéed ground beef and onions, then substitute other ingredients for whatever you have on hand. Sweet potatoes could be a nice sub for white potatoes. In the winter, nix the corn and try frozen peas instead. Green beans and celery could also be great additions. I almost didn’t cover this skillet with cheese and broil it, and then I thought, “Who am I kidding? Everything is better with melty cheese.” And that was certainly the case with this dish. A few minutes under the broiler gave this casserole/stew hybrid the perfect crispy, cheesy, golden brown crust. The final dish was a huge hit with the whole family, including the 3 year old, who ate more vegetables in this one meal than I think he normally eats in a week (can I get a hallelujah)? 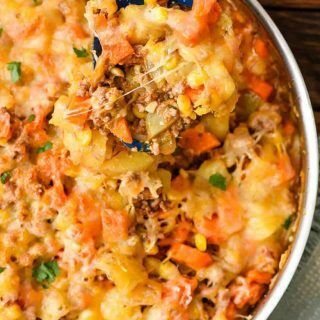 If you’re looking for a hearty, quick, and budget friendly meal to serve your hangry families this back to school season, definitely give this skillet a try. Whenever you purchase and cook with Ohio beef, you’re supporting not just the 17,000 beef farming families in our state but an entire community of small business owners, animal caretakers, nutritionists, and environmentalists who are committed to providing you and your families with safe, nutritious beef. This recipe is sponsored by Ohio Beef. As always, all opinions are my own. 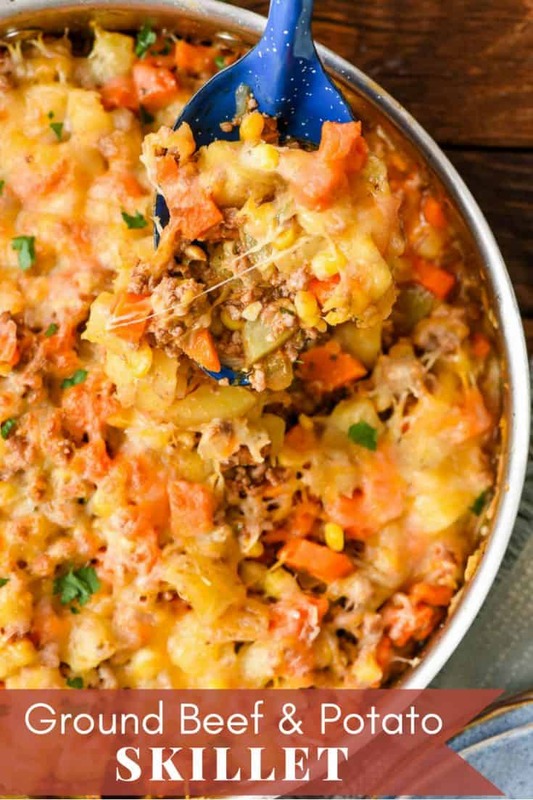 Loaded with veggies and a crispy cheesy topping, this Ground Beef and Potatoes Skillet is a satisfying one pot meal the whole family will love. Heat the oil in a large oven proof skillet over medium heat. Add the ground beef and onions and saute until browned. Season with salt and pepper. Drain all but one Tablespoon of fat from the skillet. Stir in the garlic cloves, tomato paste, and Worcestershire sauce and stir and cook for 2-3 minutes. Add the diced potatoes, carrots, and corn and cook for another 2 minutes. Stir in the beef broth, using a spatula to scrape up any browned bits from the bottom. Increase the heat and bring to a gentle boil. Cook for about 10 minutes, stirring occasionally, until the vegetables are softened. Season the mixture to taste with salt and pepper. Sprinkle the cheese on top and place under the broiler for 2-3 minutes or until melted and golden brown. The vegetables in this skillet can definitely be swapped out based on your family's preferences or what you have on hand. 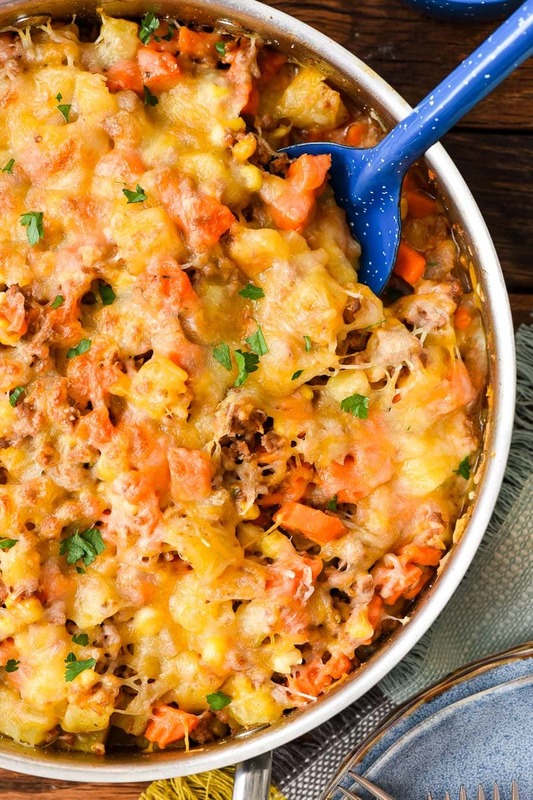 This is SUCH a family-friendly comforting meal! My husband is going to LOVE it! I don’t understand how “diced” russet potatoes and carrots are supposed to be done stove top on medium heat after 12 min with 2 min in broiler. This recipe is a disaster and ended up having to be put in the oven for an additional 30 minutes. Maybe say “minced” next time, or “finely chopped”. I’m so sorry this took longer than you expected to cook. Dicing usually refers to a smaller size than chopped, but I will try to make that clearer in the recipe. I hope it still tasted great for you! I diced mine (about a ½”: cube) and I needed to add a little more liquid and 2 minutes on the stovetop, but other than that, it came out great. How big did you dice your veggies??? Just wanted to sat this came out AWESOME! I needed maybe an extra cup of beef broth in order to cook the veggies, and added about 2 minutes on the stovetop, but as they say, that is you cooking. Minimal adjustments and a great recipe. 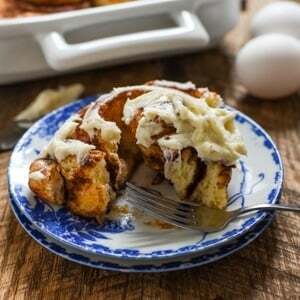 Already pinned to my “Favorite Weekday Recipes” board! Absolutely love hearing that! I’m so glad it worked out well for you. Love easy skillet dinners like this! Easy to make and easy clean-up! This is a great dinner any night of this week! Hi love this recipe and tried to print it to make this meal tonight but, the print button on the recipe wasn’t working. Love so many of your recipes thanks for all the wonderful posts. Hi Debbie! Thanks so much for the kind words and for reading the blog. I’m so sorry you weren’t able to get the print button to work. I just tried it, and it did work for me. It pulls the recipe up on a separate page, so you might want to check to see if the printable recipe is in a separate window or tab on your computer. I hope it works for you now! Thanks so much for being a reader–I’m so glad you enjoy the recipes! The more cheese the better! Looks like my kind of comfort meal! 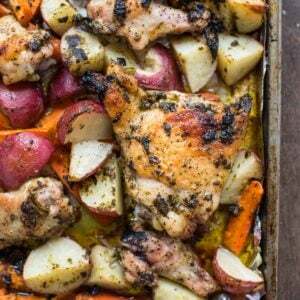 This is my kind of weeknight meal! I’m putting corn in EVERYTHING right now. What a great meal! Made this for my family and it was pretty good. My family commented that it was missing something. What can we add to this to make it creamier? Hmmm…were you wanting it to have a gravy kind of base? You could always make a country gravy to stir in or add a canned soup of your choice. Got many compliments on this from my boyfriend! I didn’t have any tomato paste so I subbed in CURRY paste and it turned out amazingly delicious. We now call it “curry casserole” haha. Just made this for my family and YUM!! I had no Worcestershire Sauce so I replaced it with some Soy Sauce. I also had no fresh potatoes so I served the ground beef/veggies over prepared “Potato Buds.” It plated very nicely. Thank you! You could melt some cream cheese in ! Add mushrooms and substitute hominy for corn. I am ALWAYS on board for adding mushrooms. I might have to try the hominy next time as well. 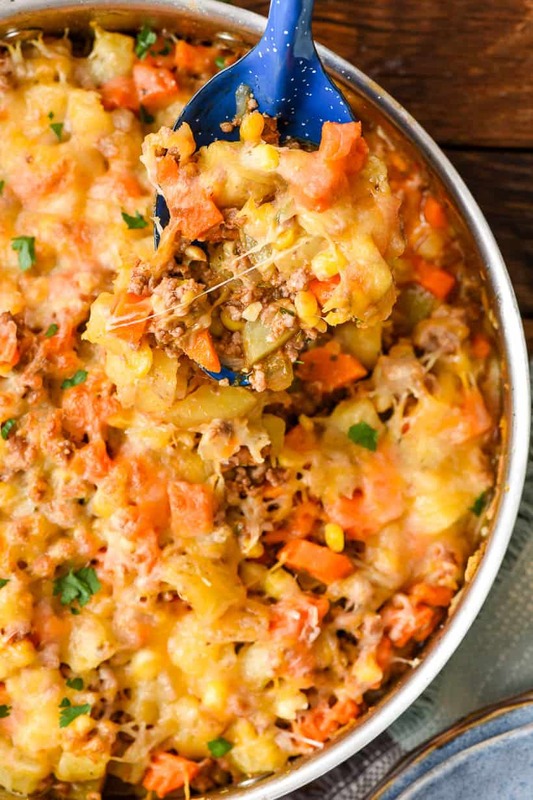 Made this tonight for St Patricks Day – called it a skillet shepherd’s pie :). Everyone loved it including my 2 and 6 yr olds. I used Simply Potatoes diced potatoes and added frozen peas instead of corn. Thank you for the great versatile recipe. I absolutely love hearing that! And what a great shortcut idea! I’m definitely trying that next time. Hi, it looks delicious but I can’t find the recipe anywhere. Can you help please? I’m so sorry about that! The recipe card went down temporarily. Please try reloading the page and the recipe should be there. Let me know if you have any other issues! I got it and made it. I replaced the corn for a little peas cause I’m allergic to corn, and added green onion. We really liked it. Thank you. We tried this tonight, it was great! Very economical and filling. I think we’ll try it with green beans added in next time. I’m so glad to hear that! Thanks for coming back to let me know! Oh! I was going to tell you that I used ground turkey instead of ground beef and it was good.